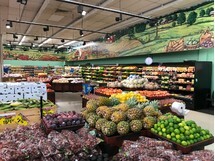 We have been recognized nationally as one of the top produce retailers in our part of the country. We consider produce to be the crown jewel of our stores. We buy locally whenever possible to put the freshest product on your family's table. We have a huge a variety of fresh produce from around the world. For example, when apples are in peak season during the fall months, we will carry up to 13 different varieties. We also have a solid selection of organic produce and throughout the year we have truckload produce events.